As we settle back into the school routine and we pass through September, let’s kick back with an old classic that still carries a lot of the same humor today that it did upon its first performance (that’s right, it’s a play!) in 1895. 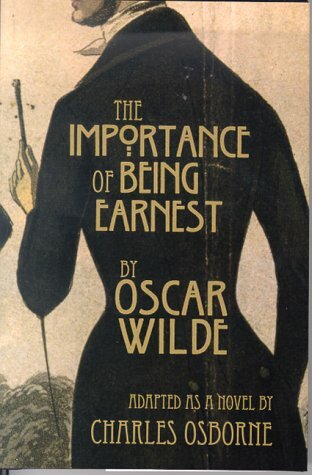 Whether you’re a drama queen looking for some new portfolio fodder or just a collegiate champion of the arts, check out Oscar Wilde’s The Importance of Being Earnest! The Importance of Being Earnest, A Trivial Comedy for Serious People, was written by Oscar Wilde in 1894, and first performed on Valentine’s Day in 1895, at St. James’ Theater in London. The plot focuses around John (nicknamed Jack) Worthing, who leads a double life as both himself – a respectable man and owner of Hertfordshire estate in the country, and ward to his young neice Cecily – as well as the London dandy Ernest, a libertine and man-about-town. He is found out of this lie by his best friend Algernon Montcrieff shortly before attempting to propose to his lady love, Gwendolyn (who happens to be Algernon’s cousin). Interested in the story of Cecily, Algernon heads out to seduce her, utilizing the name Ernest as well. In this topsy-turvy war of love and manners, the importance, in the end, lies in being direct, truthful, and earnest (hence, the title). The Importance of Being Earnest has been adapted for the large screen several times, and usually easily so, due to the writing’s already-implied direction, from its original status as a play. The most popular adaptation is most readily noted as the 2002 film, starring Colin Firth as Jack and Rupert Everett as Algernon, as well as Dame Judi Dench as Lady Bracknell. This film adhered closely to the play; however, a notable addition was made to its cast of characters: the solicitor Mr. Gribsby, who persues Jack to Hertfordshire, was present in the original draft of the work, but was eliminated from the script by the play’s first producer. The costuming of the movie was done to primarily adhere to the Victorian stylings of the time period. The play is currently being revived in London by notable media star Stephen Fry (who will star as the dour and decisive Lady Bracknell), and talks have apparently started with several high fashion designers to tackle his costuming, including Roland Mouret, Alexander McQueen’s creative director Sarah Burton, and John Galliano. By integrating elements of the play into your own look, you can pay homage to the classic satirical play, without getting trapped in the Victorian trappings of the corset and hoopskirt! Product Information: Blouse – Oasis, Skirt – Forever 21, Headband – Forever 21, Earrings – Kate Spade, Bag – Target, Flats – PacSun. The war of prevalent social attitudes – present in Jack’s conflict between pillar-of-society John Worthing and his alter ego, the libertine Ernest – between what is respectable and traditional, and what is trendy and modern, began to emerge during the Victorian era. The juxtaposition of a gentleman’s responsibility and the flagrant overthrowing of those same principles occur in the narratives of both of the lead male characters. The idea of a “dandy” himself was a character close to the flamboyant and fashionable Wilde’s own heart and he was one of the first to perfect the trope for the stage. In an all-out outfit war of the Victorian versus inherently modern, channel the traditional in a lace top, black bow headband, and a serious black tote, while the fashion and “shock” value of trends comes out in neon-bright flower earrings, cat-faced flats, and a leather-look skater skirt. 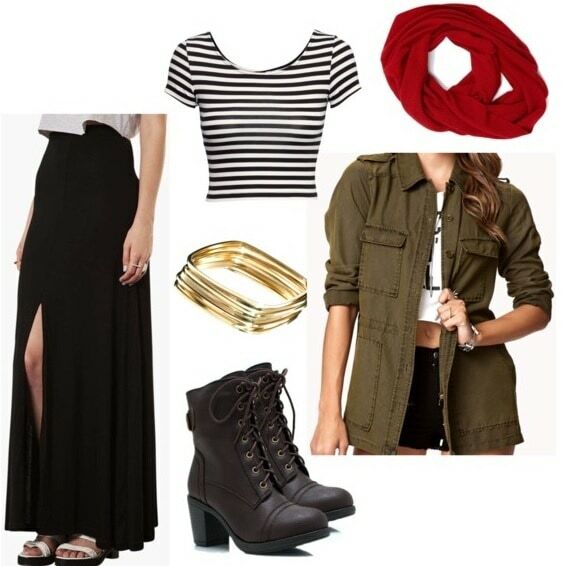 Product Information: Skirt – Topshop, Top – H&M, Bangles – Asos, Boots – GoJane, Scarf – Nordstrom, Jacket – Forever 21. The main settings in the play are the city of London and the country estate of Hertfordshire, the societal divisions of which help delineate the alternate personalities of Jack Worthing – the scandalous city dandy and the respectable country gentleman. The two social circles present in these areas provide the motivation for his two-faced practices, as he must present a stern face in raising his young niece Cecily, while acting against his own advice as a fop in the city when around his friend Algernon. Therefore, the divisions between “town” and “country” are integral to the narrative as a whole. Integrate the sharp divides between social circles in your own look, by using both country staples and city chic pieces in sharp contrast. Get rough and ready with a utility jacket, a chunky infinity scarf, and hiking-inpired heeled boots, while the sleek fashion of the city comes out in a maxi skirt with a sky-high slit, a striped crop top, and minimalist square bangles. Product Information: Hat – Uniqlo, Coat – JCPenney, Dress – Charlotte Russe, Shoes – Asos, Lipstick – Nordstrom, Gloves – H&M, Tights – Charlotte Russe. The major plot of the play rests in the revelation of some pretty major surprises that are beyond the name game that John and Algernon orchestrate. These grand revelations and underlying satire of the whole show are spectacularly set against the intense Victorian sense of propriety that show business itself ran on during this time period. This play was classified as a social drama, one that was meant to reflect life to the high society sitting directly across from the actors themselves; their drama was supposed to be slightly-exaggerated, but familiar. Therefore, the true trick came in surprising these fashionable people, in a way that was wholly unexpected, but still closely related to them. Channel both the straight-laced traditionalist attitude of the Victorians, as well as the surprising nature of Wilde’s work, by crafting an outfit made of seemingly basic pieces, that aren’t so basic. Tights with a cute bow pattern, low-sided Mary Jane flats, a LBD with edgy cutouts, a shrunken-down trench, and a glove with exaggerated zipper detailing are unique and unexpected variations on classic pieces. Top it all off with a cool bowler hat and a swipe of shockingly pink lipstick. 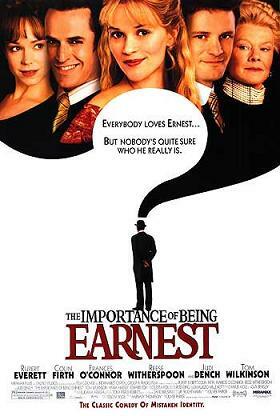 Have you ever read The Importance of Being Earnest, or have you ever seen the play? Have you seen the movie, starring Colin Firth? What do you think of the humor and satire present within the work? Have you read any other works by Oscar Wilde? What do you think of the outfits and styling tips? Let me know, in the comments below!